Woke up to the sound of wind howling against my window, it’s blowing an absolute gale out there. I was supposed to be doing a boat trip in the fjord today, but as with all tours in Greenland it’s dependant on a minimum number of people booking, and despite another two hardy souls signing up were were still three short, which given the weather I was slightly relieved about. I thought this might happen (even before the weather turned) and had a hike planned for today, apparently there’s quite a good one you can do from Circus Lake near the airport around the mountain Little Marlene. Looks like it’d be a good four or five hour trip from the centre of town though, and given the weather and the fact I’d be going out alone I don’t really fancy it, which does give me the chance to have a lazy day and finish looking around town. Breakfast at the Seaman’s Hotel is a Scandinavian buffet type affair, although disappointingly without any fresh fish or vegetables which I’ve always seen in the other North countries. I do like the canteen at the Seaman’s Home though, it’s kind of a cross between a school canteen and workers /transport greasy spoon, you know where you are with it and for Greenland the prices are pretty reasonable. Judging by the clintele in the canteen most of the other guests here are Danes, and look like they’re here on business. 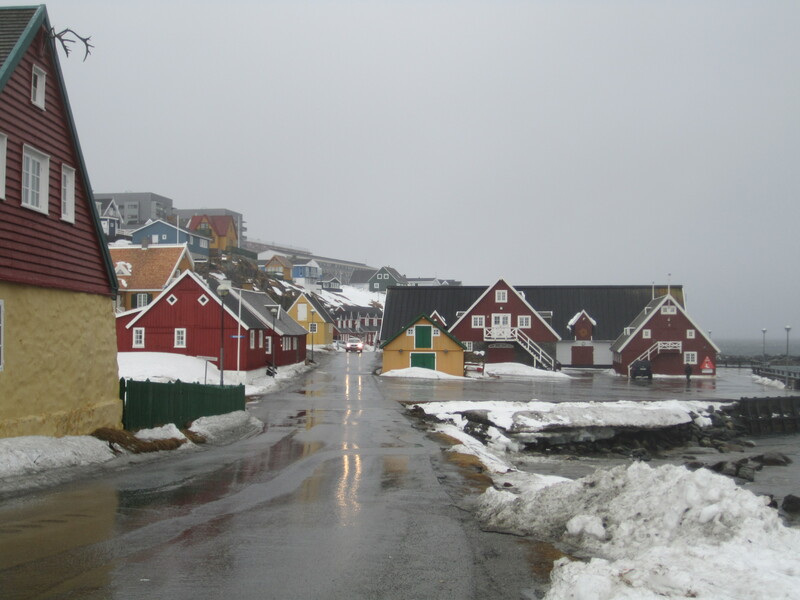 I wandered round what’s known as the old town, which is probably the nicest part of Nuuk and could almost be a traditional Greenlandic village, no huge ugly tower blocks here. There’s not too much there but the houses are pretty. 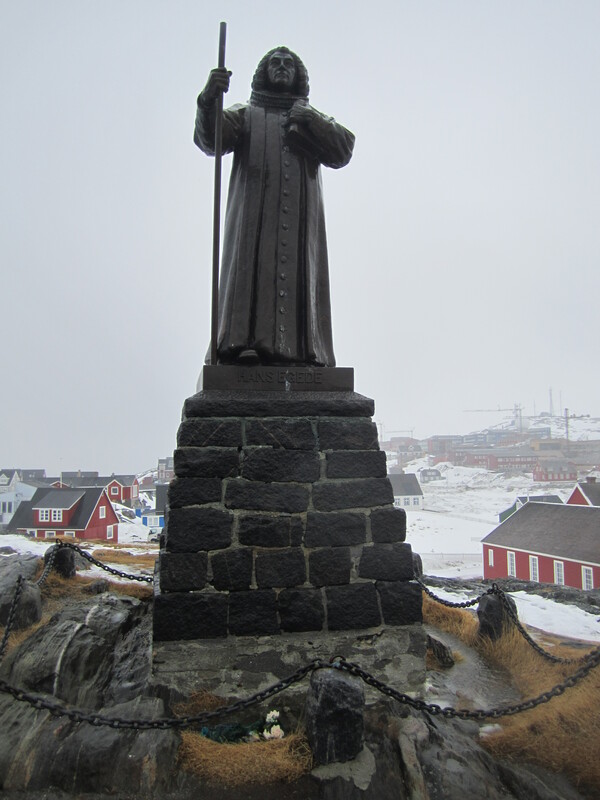 There is a statue of Hans Egede (the Norwegian Lutheran missionary who founded Nuuk), and a nice looking church although it’s locked so I can’t look around. After about half an hour in the elements I need to warm up so went for a tea in the cafe at the shopping centre. They don’t have milk but have sachets of “coffee whitening powder” – not seen anything like that for a few years but I guess up here you have to make do! Had lunch afterwards at the culture centre, which has an excellent cafe. 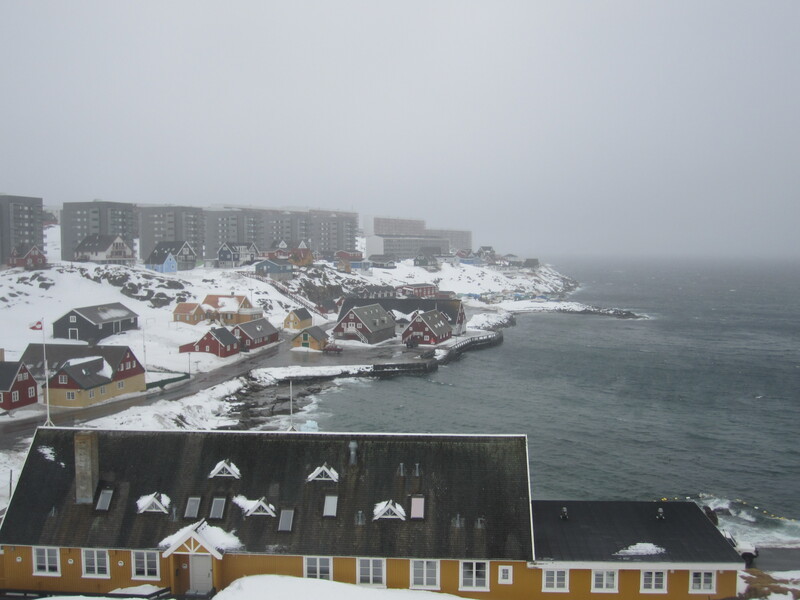 I had possibly my best meal in Nuuk here which was the fish of the day (cod). 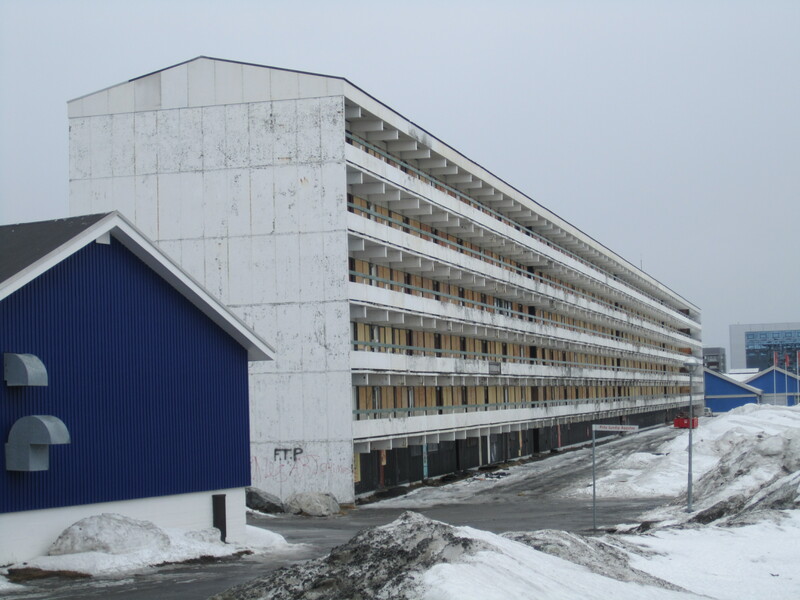 Afterwards I walked past the infamous “Blok P”, probably the worst of the massive estate blocks that were built in Nuuk to house families that were moved here from surrounding villages in the 1960s. 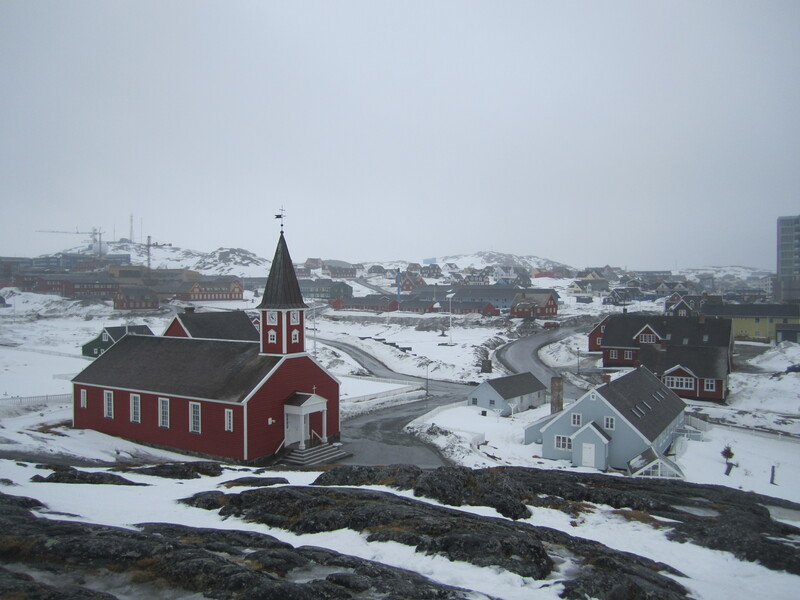 This one building used to house 1% of the entire Greenlandic population. It’s now boarded up and graffiti daubed so looks like everyone has been rehoused, which I don’t think many people will be too sad about. A very drunk Greenlandic woman kept trying to have a conversation with me, she didn’t speak much English and was speaking a mixture of English and Danish (I understand a little bit of Danish as I once learnt some Norwegian which is incredibly similar) From what I could understand she seemed keen to express her disapproval at foreigners taking “her stones” which I understood to be a reference to foreign mining companies who are prospecting a lot in Greenland at the moment. She was also keen to explain that Greenlandic people love to dance and she left to go to Kristinemut to do just that. Takuss was my favourite bar in Nuuk, it seemed to be the only place I went where both Greenlandic and Danish people drink.